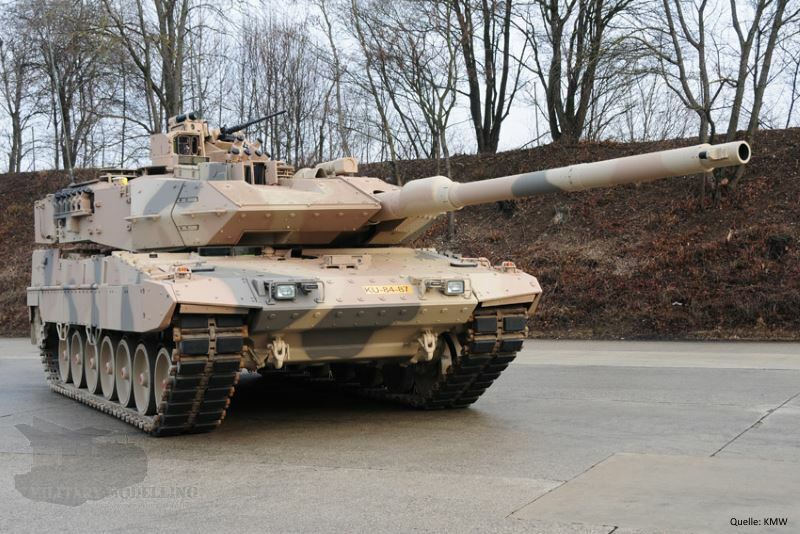 At the end of 2014 the Leopard 2A7 was delivered from KMW to the German Armed Forces. The development of Leopard 2 still carries on. The 2A7 was developed using some of the knowledge learnt from the earlier 2A7+ programme. Qatar, a small state on the Arabian Peninsula in the Persian Gulf, has already bought 62 Leopard 2A7+ from KMW in 2013. 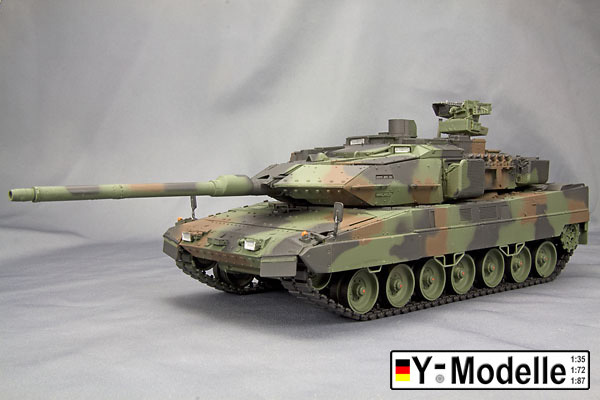 In the spring of 2015, Y-Modelle delighted us with a conversion kit in 1:35 scale of the German Army~s Leopard 2A7. 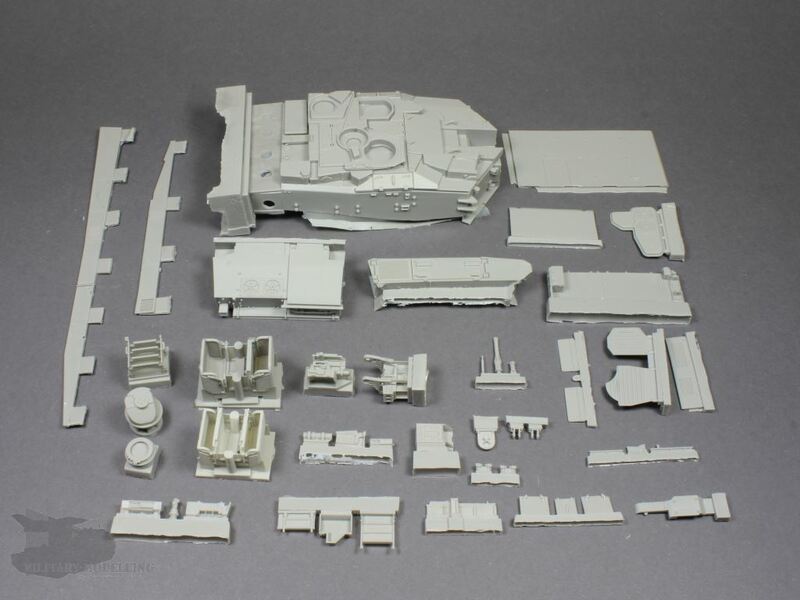 Now the Leopard 2A7+ follows and this new conversion kit is definitely worth a look. Leopard 2A7+ has been around for quite a long time now. It is basically a continual development programme and the tanks are changing all of the time. 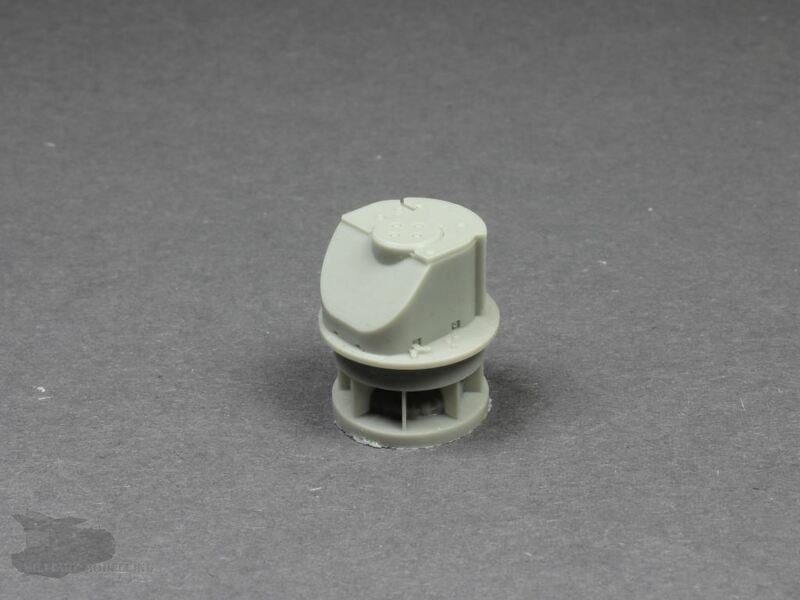 Against the previous model, the Leopard 2A6, the system components were optimised to protect the crew. Passive all-round protection for the crew against threats such as roadside bombs, mines and bazooka fire. Interface for attaching implements such as a mine plough, mine roller or a dozer blade for clearing mines, booby traps or building debris blocking the roads. 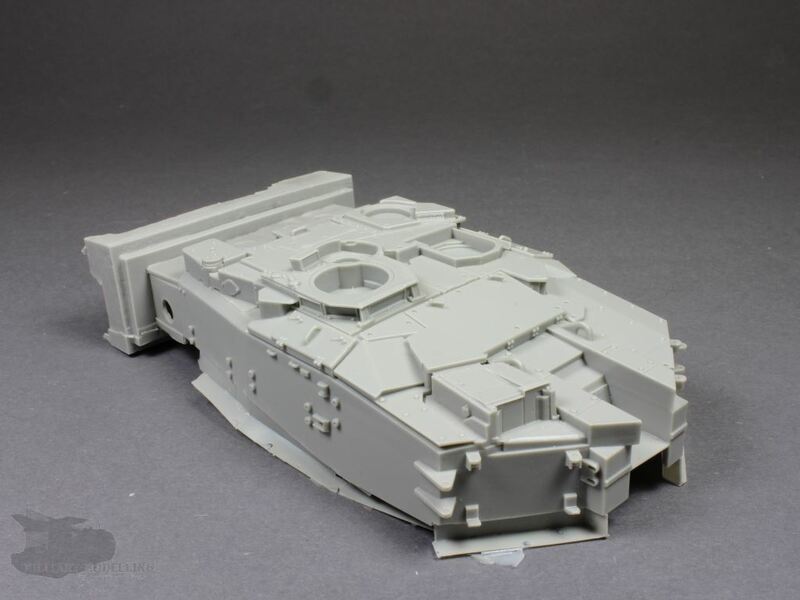 Cooling system for both the turret and chassis. Increased power-rated additional power generators for check-point missions. Communication interface on the exterior of the vehicle for dismounted forces. Combined driver's night vision (thermal imager/image intensifier) at the front and rear. Improved opto-electronics (day/night) for reconnaissance over long distances. Digitised and multi-functional user concept. The 10.97 m long MBT, at an MLC of 70, reaches a top speed of about 72 km/h, with a range of 450km. The armament consists of the well-known 120 mm L/44 or L/55 smoothbore gun, a 7.62 mm machine gun and the FLW 200 with 40 mm grenade launchers or .50 cal machine gun. The crew of the Leopard 2A7+ consists of driver, gunner, loader and commander. 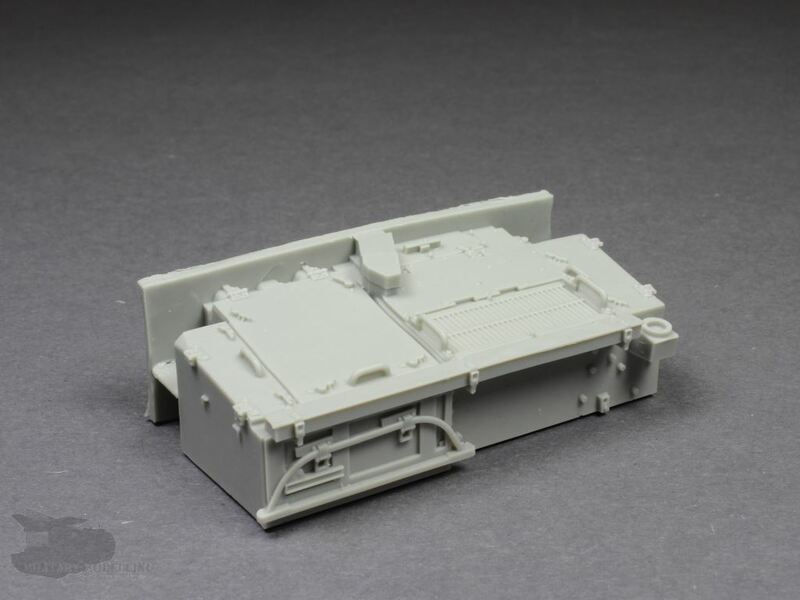 Here we present the kit from Y-Modelle of Taufkirchen (item number Y35-148), produced in 1:35 scale. This kit depicts a configuration which seems to be close to, if not identical to, the Qatar configuration, when compared to rare pictures of these machines during their first parade in late 2015. In this case, it is the most modern Leopard 2 around. 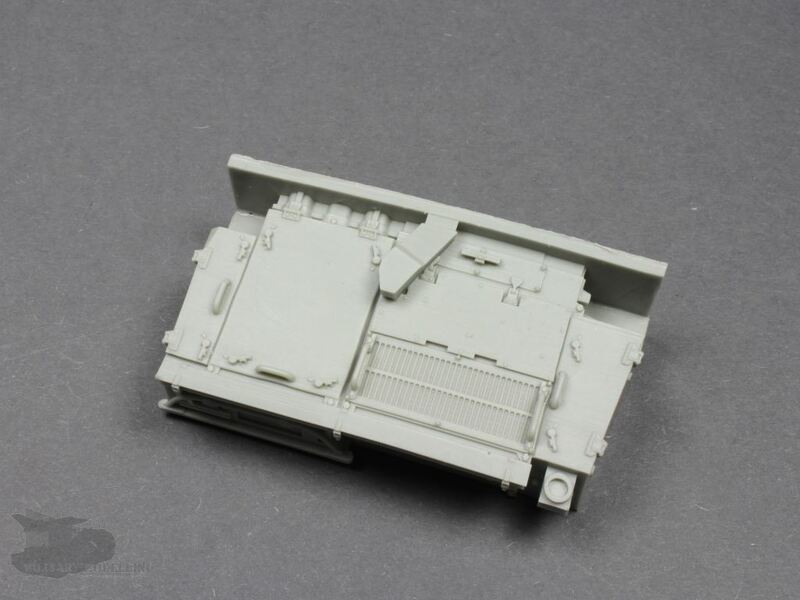 As a basis for this conversion kit, the Leopard 2A6EX kit from Hobby Boss (SKU HB82403) is required. 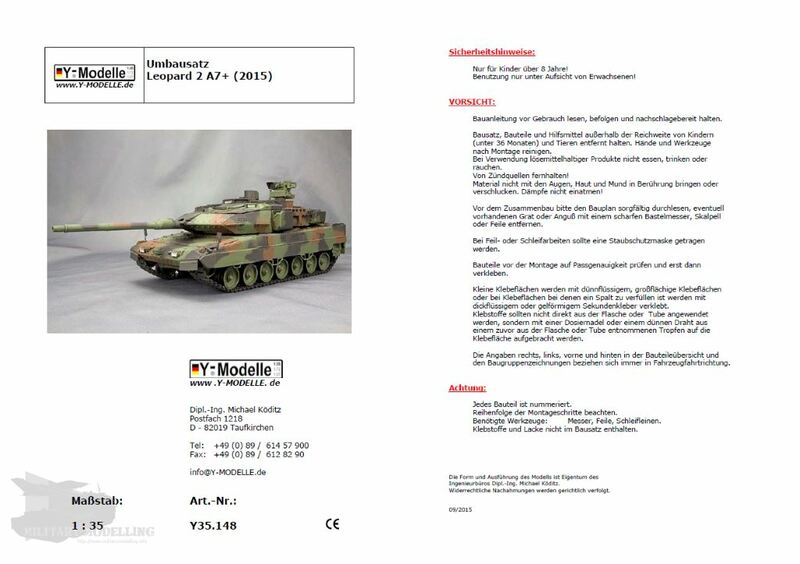 This is not to be confused with a previous Y-Modell 2A7+ (Y35-115) which was based on an earlier development version which depicts a demonstrator vehicle from 2009 which was later tested by the Bundeswehr. 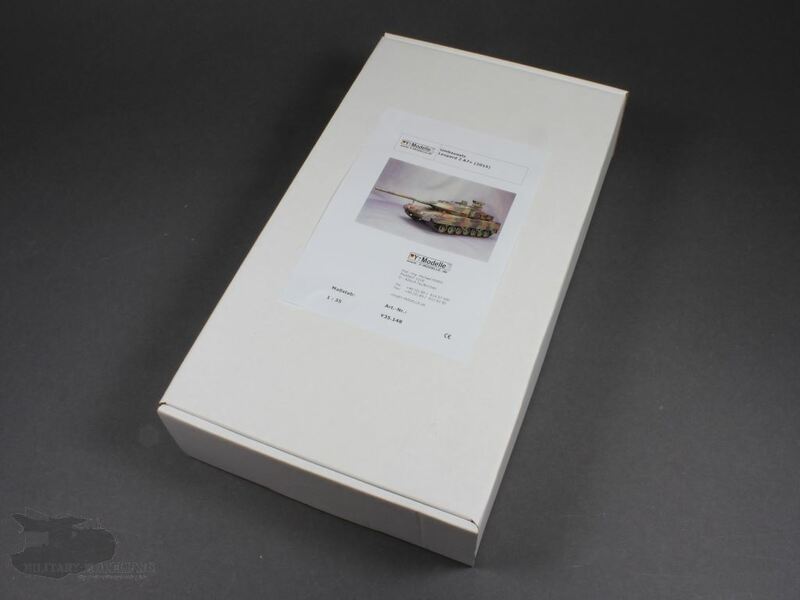 The kit was delivered in a strong and generously-sized cardboard box with a photo of the finished model on the package top. Inside the box there are the ziplock bags with the parts protected by foam chips. Furthermore, building instructions for the kit are included in the box. Photo-etch parts or decals are not available. At first glance, the parts make a good impression. The full-colour instructions are in the form of an A5 booklet. In total, it has 8 pages. 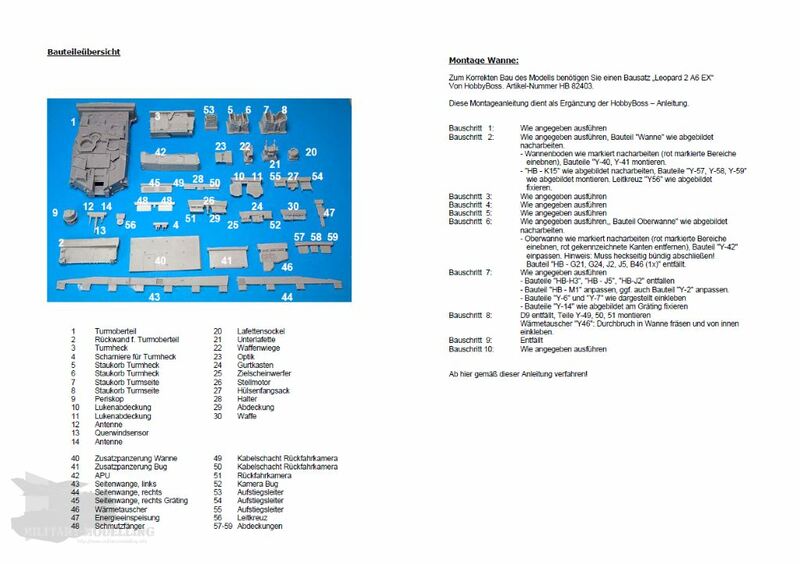 On the title page, the contact address of Y-Modelle is shown with a list of the construction stages and a detailed component list on the following pages. In addition, there are safety instructions for dealing with resin. The construction stages of the conversion are carried out in the form of photographic steps with instructions in German. The instructions, as well as the accompanying photos, are usually clear but can also raise some questions. The photos could be a bit bigger. Here, it would definitely benefit modellers if Y-Modelle would make the manual available in digital form by download. The 47 components are made of light grey resin with a sharp and offset-free cast. I could not discover any air bubbles or voids. 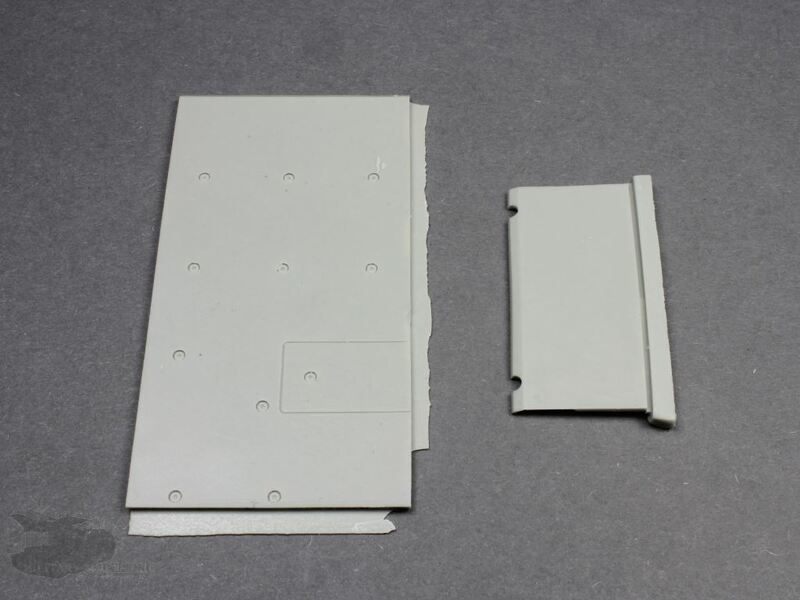 The casting blocks of the components are sensible and reasonable. 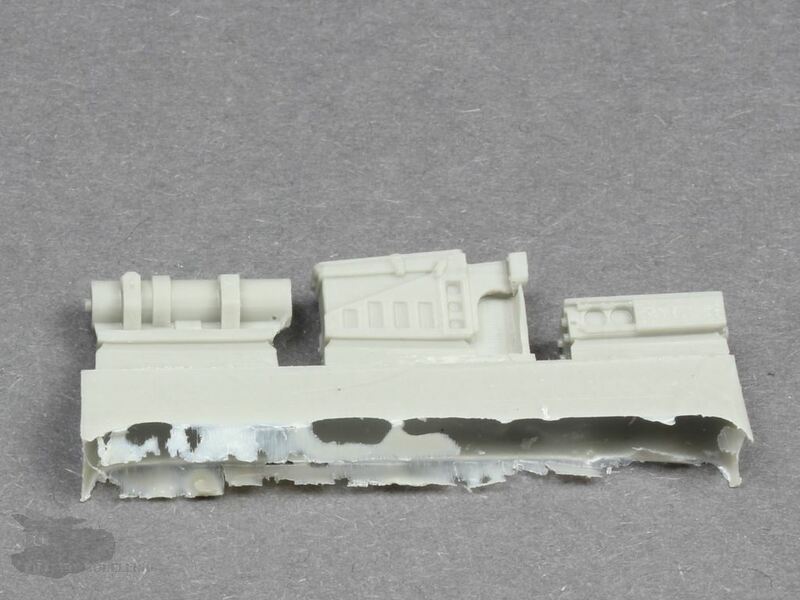 Removing these should not pose any problems to the modeller. 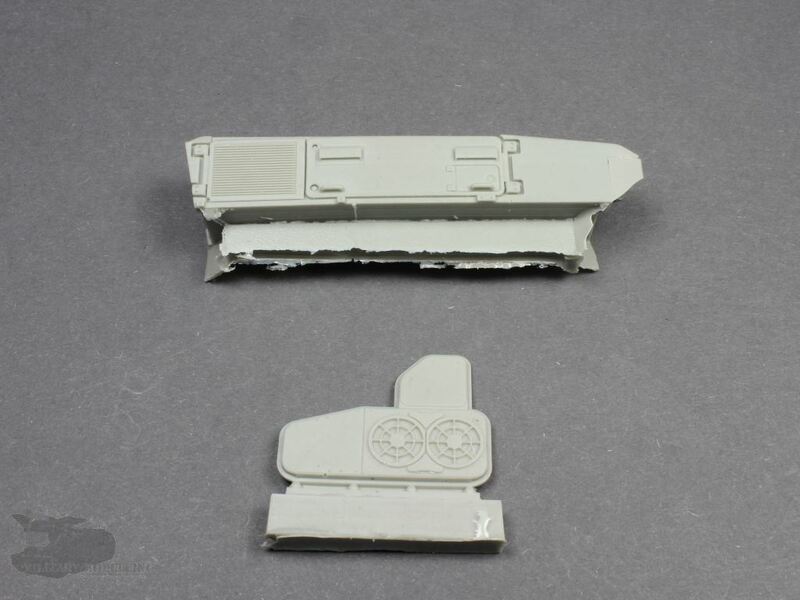 The largest component of the the Leopard 2A7+ conversion kit is the upper part of the turret. This is a great component that is cleanly cast without error. Well done! 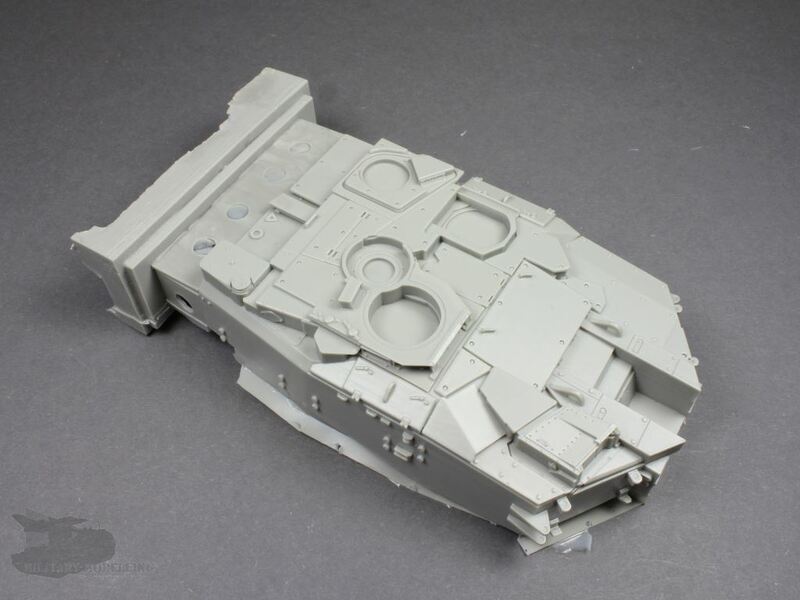 The turret takes care of the different hatches and side walls with the relevant details cast on. Also, the updated PERI is included as a separate part. 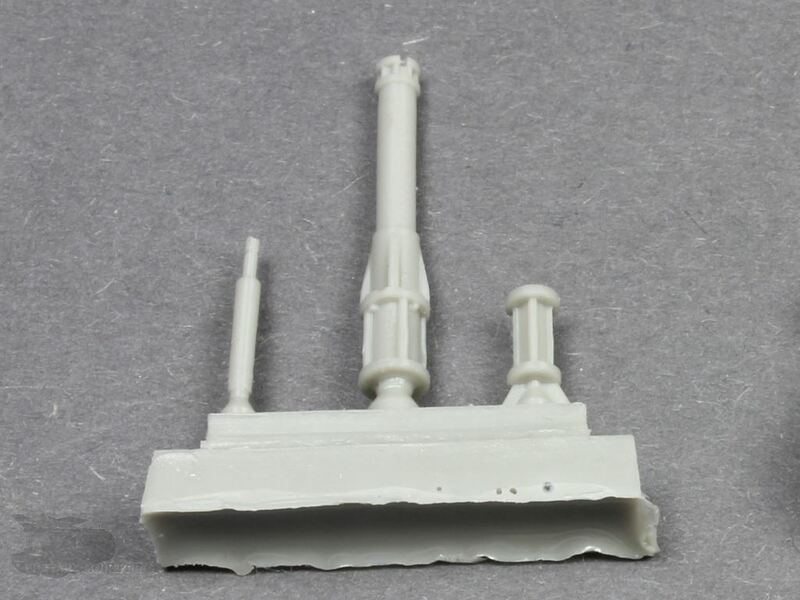 This conversion kit includes the improved mine protection of the original. 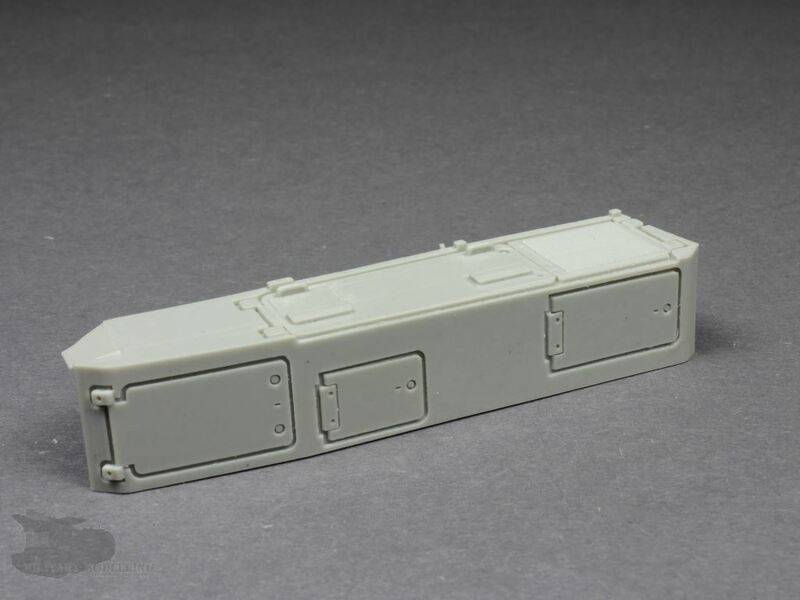 As with the conversion kit on the Leopard 2A7, it consists of mine protection for the tank belly and the front of the hull. Scale thickness and design correspond to my knowledge of the original. The auxiliary power unit (APU) comes as a complete component, therefore replacing the right rear of the hull rear base assembly. The valves, fittings and grilles are executed very well and stand by my references (see below) of the original in every way. 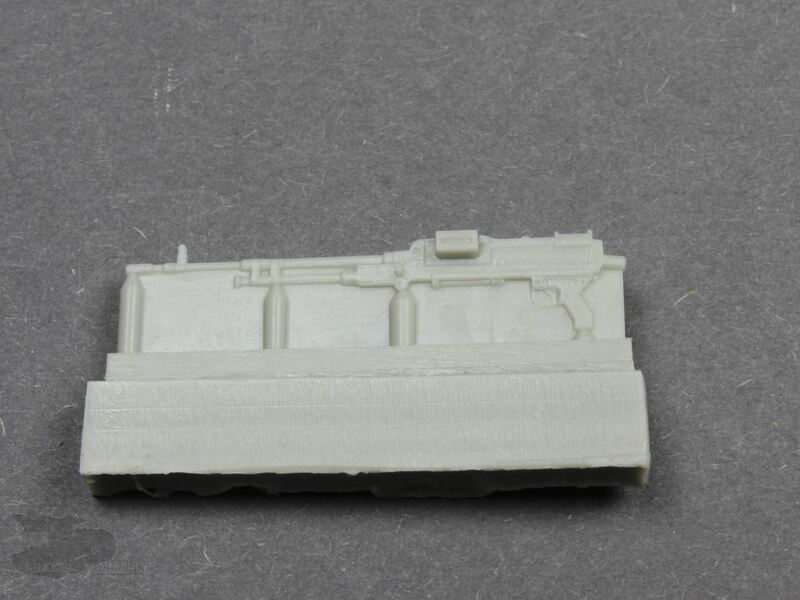 Also, the newer tool boxes on the rear and the new intercom are the same as the 2A7 kit. The heat exchanger is present as a separate component. 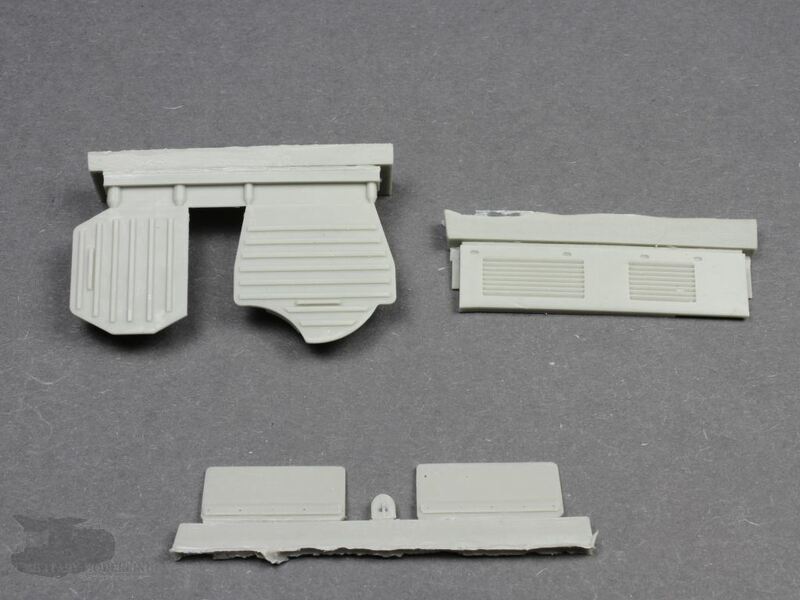 New side walls replace the kit ones, with new adapter plates for additional skirting or bazooka defence systems. Very nicely done and not forgotten. The turret rear - incidentally, the second largest component with an integrated air conditioning unit - is beautifully designed. 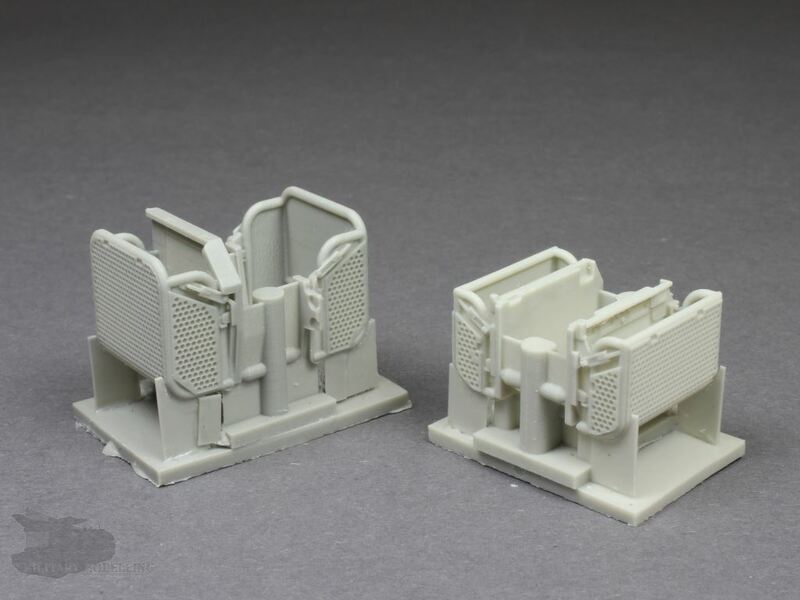 The details of the closures and flaps show extremely fine detail. The storage bins are separate components. Here, my recommendation is to drill this out for a more realistic representation - a Sisyphean task (a task that can never be completed!!). 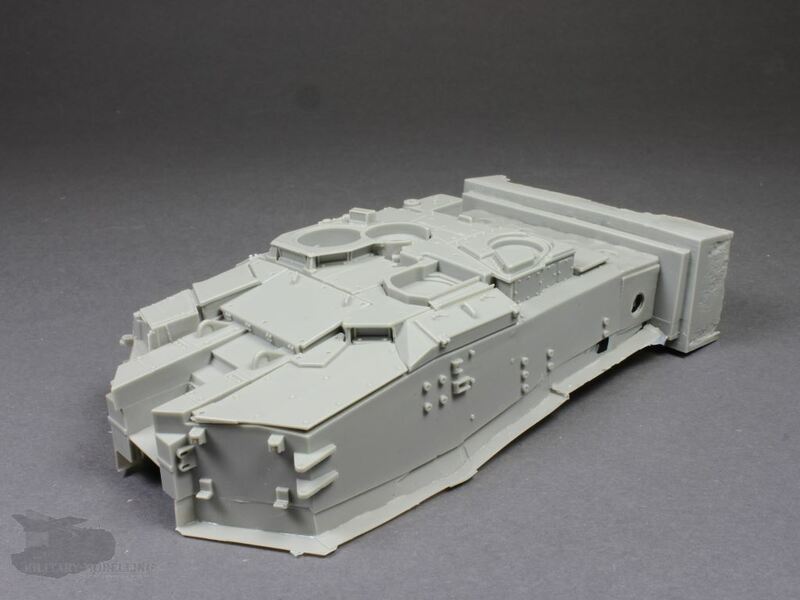 Nevertheless, Y-Modelle has done a great job here. Front- and rear-cameras and cable ducting is included. The altered intercom, the antennae and the cross-wind sensor are formed in great detail. The crew~s ladder at the rear hull has also not been forgotten. Of course, the FLW200 - a turret-mounted, stabilised secondary weapon system - should not be missed. 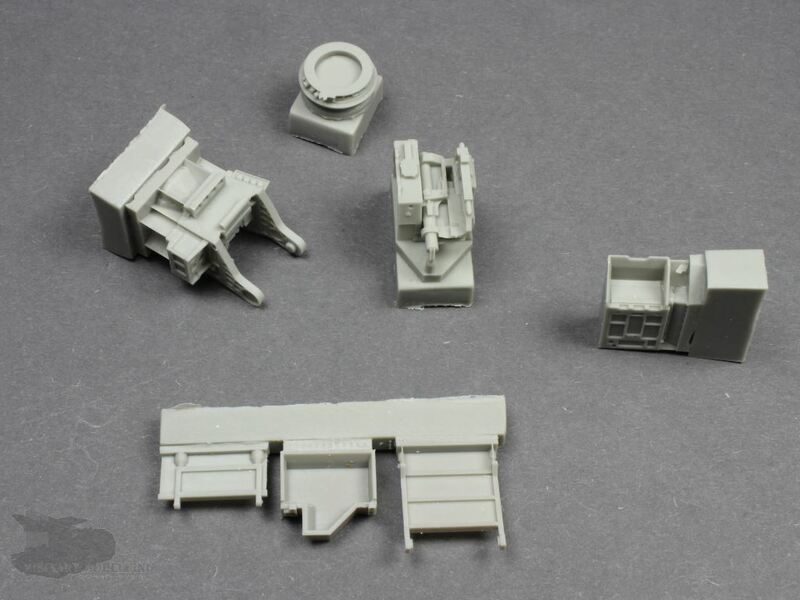 Again, the components comply with the kit that is available separately from Y-Modelle which I have already presented on my webpage. 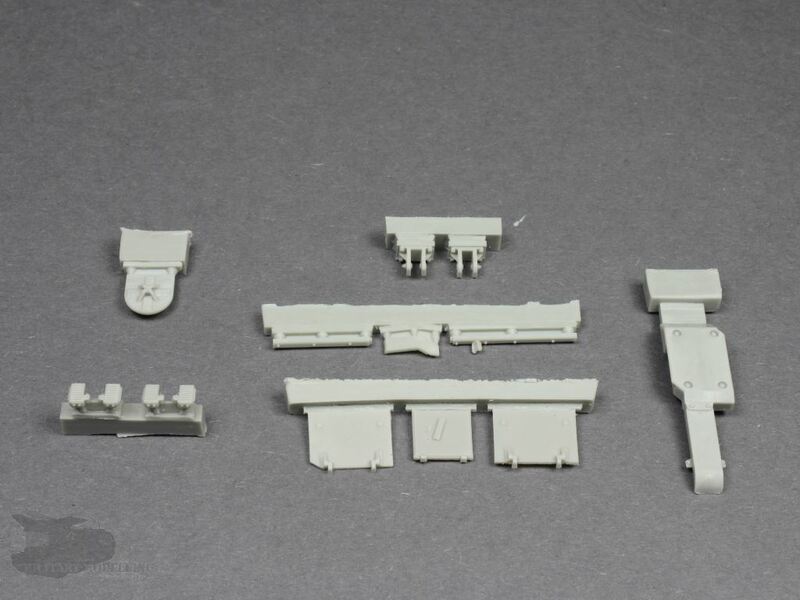 As expected, all the components are properly detailed and cast. What is very interesting is the part with the number 30. This weapon is an FN MAG. It will be used in the future by user-states built in to FLW. Unfortunately, the building instructions don't show their positioning, which is too bad. To show references is quite difficult. I have, unfortunately, apart from KMW pictures, no concrete sources. But perhaps there will be relevant literature sometime in the future. 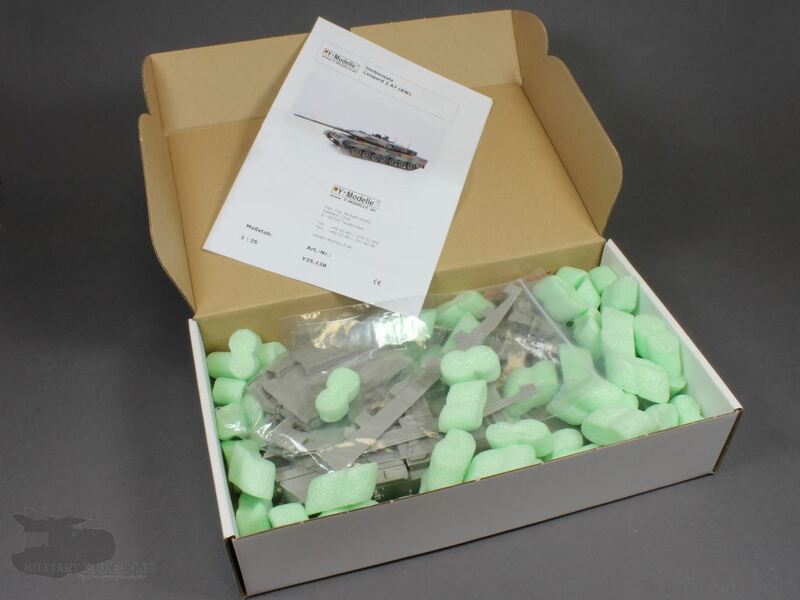 This fairly extensive conversion kit allows us, in combination with the base kit from Hobby Boss, to build a fine model of the latest development Leopard, the Leopard 2A7+. 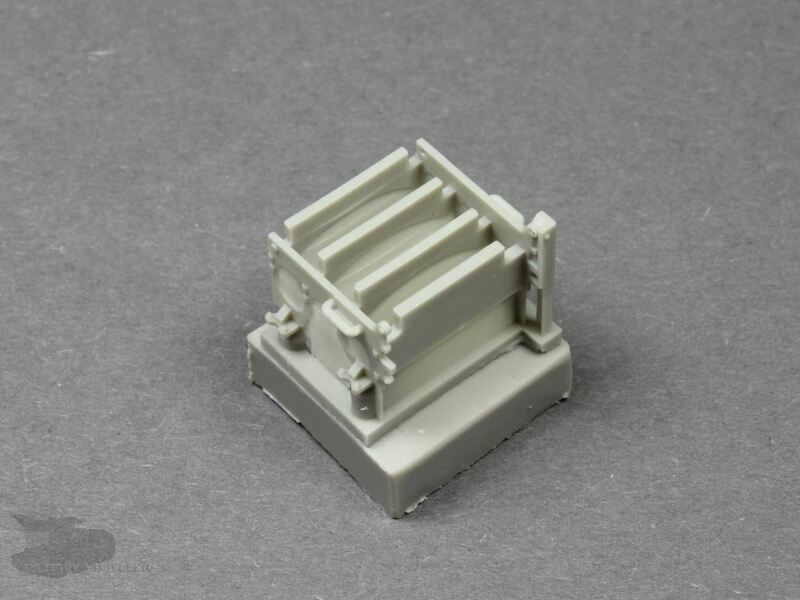 As previously, Y-Modelle has produced with the first-hand knowledge nice and detailed components. 3D printing sends his regards. The casting is impeccable and without visible defects. Perfect. The price, unfortunately, is in the superclass!! 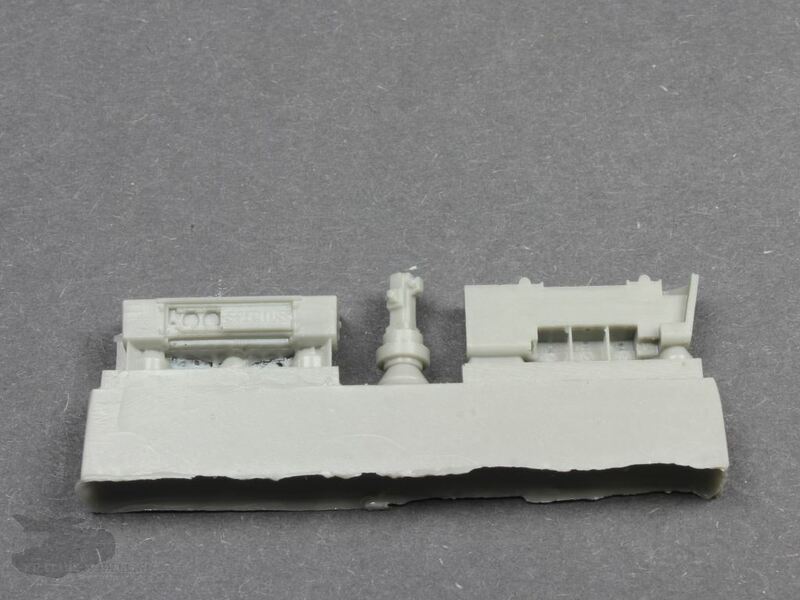 For resin beginners, this kit cannot be recommended due to its numerous components and the difficulty of understanding some of the building instructions. 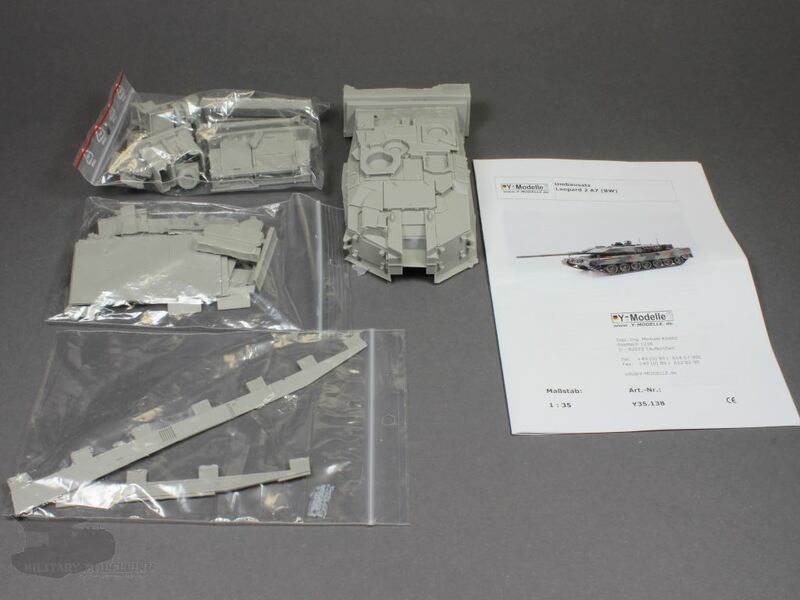 Again, a successful high-quality kit of the one of the latest Leopard 2s from KMW. 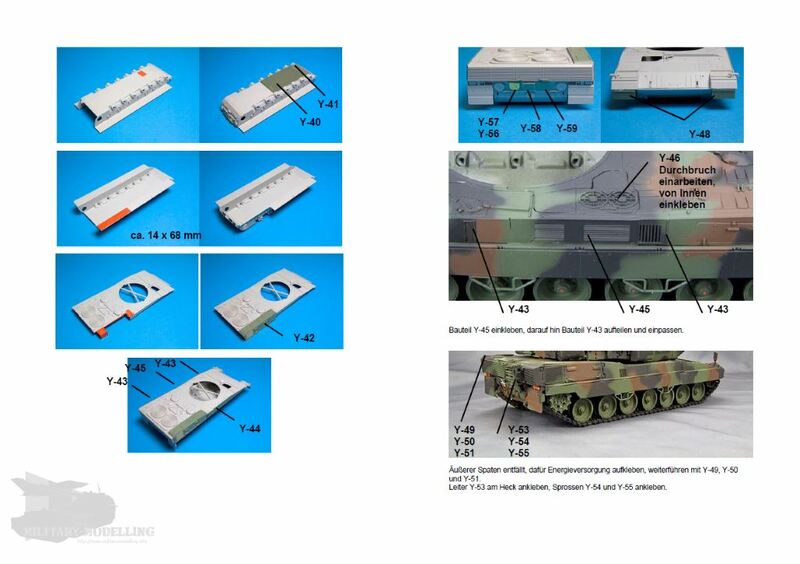 If you want to build a Leopard 2A7+ at the moment, you cannot avoid this conversion kit. 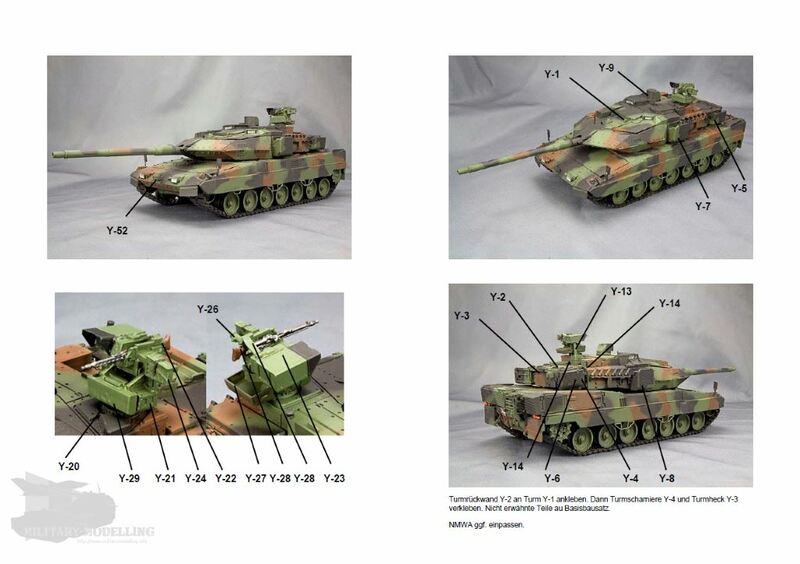 For me as a friend of the Leopard MBT, this kit gets a clear recommendation.